There are tons of awesome pool design features you can include in your new build. Last week we talked about how important it is to set up your new pool build this fall so that it can be constructed in the spring and ready to go by summer. 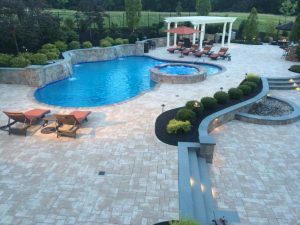 If you have your new pool build scheduled, great, but now you need to start thinking about what design features to include in your new build. Do you want a diving board or a spa? Does your lawn slope or have hills? Here are a few things to consider before you start planning your new build. Fire features are a fun and striking way to light up your pool. Usually operating off natural gas, fire features can be turned on with the push of a button, making them as easy to turn on as a light. Unlike a usual landscape light, they give off an elegant ambiance that will make your pool feel even more luxurious. Does anything represent the care-free fun of a summer pool party like a diving board? If so, it must be a water slide. Either of these additions to your new pool design will make for endless fun throughout the pool season. Diving boards and slides can even be incorporated into natural features to give your pool a natural and seamless look. Natural features are usually incorporated into a new pool when the pool has to built on a hillside. Retaining walls that utilize stone and landscaping make your pool look like it was there all along. These types of retaining walls are natural home for water slides and fountains, since the slope is already leading to your pool. Building on a hillside is a great opportunity to incorporate a spa into your design, and you can keep it in line with the natural theme, too! Not every summer night is as warm as you might remember, and after a long day in the sun even a relatively warm night can feel chillier than it is. The best way to combat that is to include a fire pit or outdoor fireplace. These features are great for extending those summer days into the night and enjoying your yard almost year round. When you have hungry guests to feed, who wants to bother going in and out of the house constantly or worse, miss out on the fun because they’re stuck inside cooking. An outdoor kitchen will keep you outside with the party and enjoying the sun. The perfect way to complete your ultimate pool experience, a pavilion or pool house is a great finishing touch. Pavilions give you somewhere to get out of the sun, and even the rain. A pool house gives you an opportunity to get a break from the heat, or can be used as a guest house for extended stays. Rhine pools has extensive experience creating custom outdoor kitchens and other outdoor living essentials. 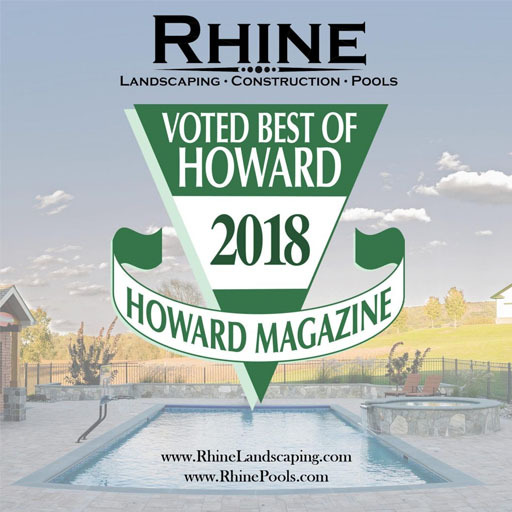 From pool houses and enclosures to water slides, Rhine Pools can help realize your vision of the perfect backyard. One of the secrets to the success of Rhine Pools is that we’re all inclusive. Clients deal with one project manager and receive answers and feedback from this person. There aren’t dozens of people and faces to remember.